Kazuo Inamori had already earned great respect in Japan for his entrepreneurial and leadership skills. These were demonstrated three decades ago when he founded the DDI Corporation (now KDDI), which become a leading telecommunication services provider in Japan. 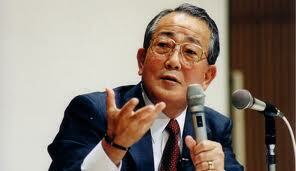 Two decades earlier in 1959 he had created Kyocera, now a multinational electronics and ceramics business. It is an interesting reflection on Japanese culture that in description of Kyocera in Wikipedia gives only the briefest mention of Mr Inamori. The appointment of Kazuo Inamori is remarkable in several ways. The BBC account mentioned his age (he was 77 when appointed). Equally unusual was his complete lack of knowledge (in his own words) of the airlines industry. The carrier had just filed for bankruptcy with more than $25bn (£16bn) of debt. The government stepped in to bail it out and the 80-year-old founder of hi-tech giant Kyocera was its choice as the new chairman. “I declined the offer numerous times because I had no clue about airlines,” he tells the BBC. “I didn’t even know that JAL had such a huge debt until it went bust,” he laughs. With little experience in the sector, he was not the only person who was sceptical. Friends and family also advised him against accepting it. But despite those objections, he took the job – without pay – because “if we couldn’t revive JAL, it would have been a huge blow to Japan’s economy which was already struggling”. Three years later, JAL is making money again and has been relisted on the Tokyo Stock Exchange. Of course, a huge injection of taxpayers’ money helped. Its rival All Nippon Airway has been criticising JAL for having an unfair advantage. How did the turn round happen? Under Mr Inamori’s leadership, JAL reduced employee numbers by over 30%, cut back on employee benefits and reduced unprofitable routes. The style of the new leader is captured in anecdotes which he likes to tell himself. Making the staff happy includes his own version of what Tom Peters called management by walking about also celebrated in the Hewlett Packard organization, among others. MBWA, Inamori style, included drop-by sessions to which the Emeritus Chairman would bring a six pack of beer for ‘nommunication’ [informal discussions]. There is a strong sense of servant leadership and ethical philosophy in some of this. Mr Inamori was trained as a Buddist priest, and even introduced what the BBC described as compulsory sessions, as well as introducing a booklet of his philosophic principles. An inevitable question arises over succession planning. Often a charismatic leader is replaced by “a safe pair of hands”. This case study will retain interest long after the brilliant intervention of the esteemed Mr Inamori. JALannounce first pay rise for staff in twelve years. This entry was posted on Saturday, January 12th, 2013 at 12:27 am and is filed under Uncategorized. You can follow any responses to this entry through the RSS 2.0 feed. You can leave a response, or trackback from your own site.